A leadership development track that drives your organization in the same direction. Whether one is responsible for an entire organization, department, small team or an individual function, the same basic principles apply. Leadership isn’t exclusive for those at the top; or at any level within an organization. Leaders at all levels should take ownership of driving key expectations. 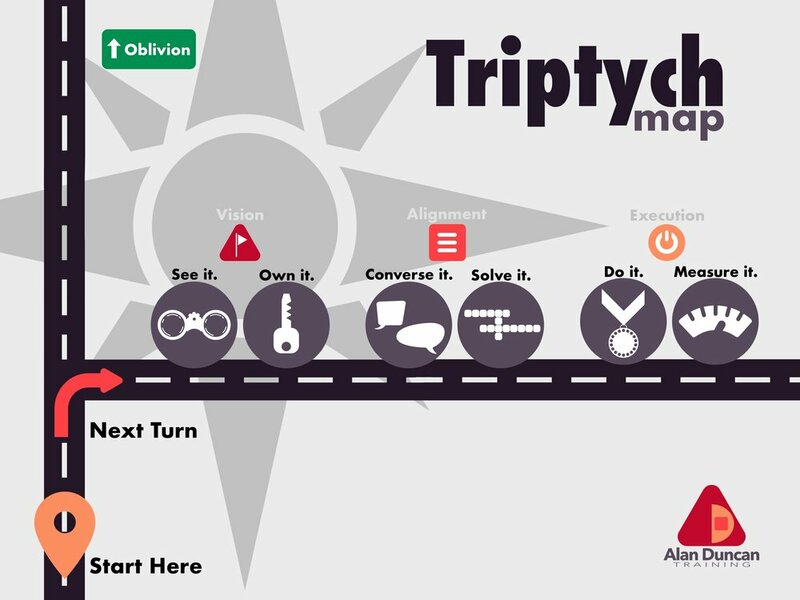 Triptych is designed to involve all stakeholders in establishing the organizational vision, building alignment toward that vision and championing the execution of that vision. Triptych begins with an introductory session which builds off an exclusive DiSC® profile. Utilizing individual assessments, the session improves self-awareness in key areas that will help all leaders get better outcomes. This highly interactive and entertaining session provides a simple process that helps all participants reflect on how to approach Vision, Alignment and Execution. We take the individual assessments from the Start Here program and combine them into a comparative report that will highlight the strengths and challenges of the participating team. With this comparative report, we customize a Triptych track to map the desired behaviors of your organization. Triptych is made up of the following six categories. Based on your organization's needs, the program can be delivered in multiple formats that include, but are not limited to, a combination of webinars, e-learning, on-site sessions and assigned on-the-job activities.